To all who have come to see this film in the theaters; and to the many individuals and groups who have tabled at screenings, sent email announcements and helped to organize benefit events! Many people who have attended Q&A sessions with the filmmakers after screenings have asked how to take action to support Tibet. If you would like to find out ways to get involved, please visit our Links page. The DVD has over an hour of exciting new material! Click here for more details! Snow Lion is scheduled to be released in the United Kingdom on August 20, 2007. Check with Revelation Films for more details regarding screenings and DVD's, etc. "Snow Lion" was honored with Special Jury Awards in 2005 at the Trento Mountain Film Festival in Italy (May), International Fsetival of Mountain Films, Poprad, Slovakia (October), and International Mountain & Adventure Filmfestival (November), Graz, Austria. THANK YOU!! 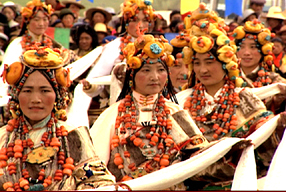 "Cry of the Snow Lion" was honored to receive the Audience Award for Best Documentary at the inaugural Bahamas International Film Festival in December 2004. Thank you very much! Want to Arrange a 35mm Screening? Although our US theatrical run has ended (over 140 cities!! THANK YOU ARTISTIC LICENSE FILMS!! ), there are still 35mm prints available for bookings. If you would like to organize a special screening in the U.S. for a group, university or non-profit, please contact Linda Duchin at New Yorker Films; for international inquiries, please contact Melissa Wohl at Harmony Gold USA. "Cry of the Snow Lion" was honored to receive a special award at the prestigious Banff Mountain Film Festival on November 9, 2003. We were also greatly honored to be the opening film at this year's Amnesty International Film Festival in Vancouver, November 6. Our thanks to these important festivals, and all who attended. The beautiful, haunting score by Jeff Beal and Nawang Khechog has been released by acclaimed world music label Karuna Music. Nawang is the first Tibetan to be nominated for a Grammy, and Jeff was recently awarded an Emmy -- their collaboration on "Cry of the Snow Lion" is not to be missed! Click here for more details about the CD. Thank you to Students For A Free Tibet, Tibet House, Tsampa Restaurant and Nawang Khechog for their help and support! A wonderful benefit preview screening and party was held on Sept. 16. "Snow Lion" premiered in New York on Friday, Sept. 19, 2003, to enthusiastic audiences and great reviews. Click here to read what the New York Times had to say about the film!